With the proximity of so many other cupcake options (Baked & Wired, Georgetown Cupcake, Scoops, etc.,) offering high quality cupcakes and all priced relatively equally at $2.50 – $4 per cupcake, the principal question is: what makes Sprinkles’ sugary treats different? 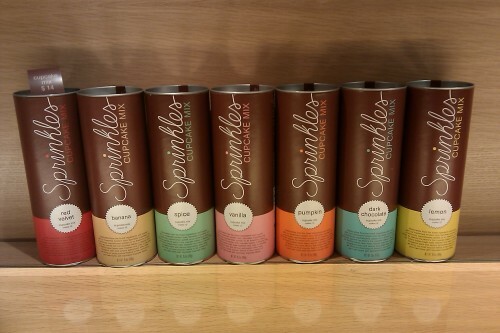 While Sprinkles, like most other cupcakes places, does cover the basic flavors (vanilla, strawberry, milk and dark chocolate, and red velvet,) it does offer unique flavors like lemon cononut, carrot, cinnamon sugar, ginger lemon, orange, banana and pumpkin. For me, it’s the fruit and vegetable combinations and flavors that make trying these cupcakes worthwhile. Sprinkles also offers seasonal flavors like Hot Red Velvet, a red velvet base with a cream cheese frosting flavored with spicy cinnamon, for Valentine’s Day and Irish Chocolate, a Belgian dark chocolate cake topped with a Baileys irish cream cheese frosting, served today through March 20, in honor of St. Patty’s Day. FYI: All of Sprinkles’ cupcakes are made without transfats. For those eco-conscious cupcake eaters, Sprinkles’ bakery boxes, napkins, shopping bags and gift-boxes are all made from recycled materials, which ties in well with the surrounding touches of wooden counter tops and tables. The shop also uses green cleaning products and implements waste programs to maximize waste recycling and minimize water usage. Other efforts include the use of green cleaning products and programs to maximize waste recycling and minimize water usage. An additional differentiator to Sprinkles is their upstairs party room that can be used for bridal showers, birthday parties or corporate events. While slightly overly pink for my taste, I can already tell this space, featuring a glass looking panel into the shop below, will be much used. As someone who doesn’t have a ginormous sweet tooth, but does enjoy a solid cupcake now and again, is Sprinkles a good place to go for a sugar fix? Yes. Is it a place I would go out of way to visit or to try out? 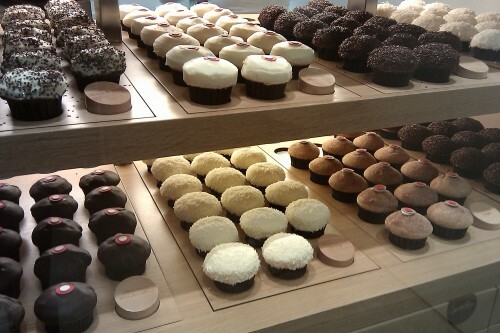 Maybe, should I find a cupcake there that I fall in love with and I can’t get elsewhere. But given the rarity with which I eat cupcakes, I doubt I’d find that Prince Charming Cupcake anywhere. About to have my first Sprinkle! @LovelyinDC What did you think? 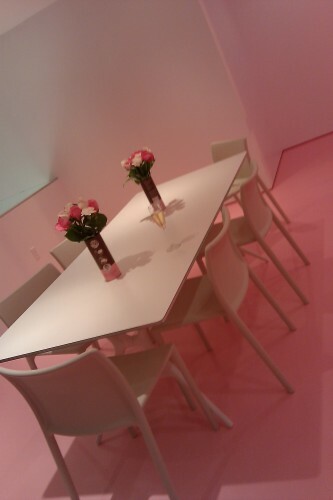 It was also the first cupcake-only bakery! I think they’re pretty good and worth a try. I went out of my way to visit when I was in LA, however I only stopped by in DC because I happened to be in Georgetown. They are pretty pricey and sometimes the frosting is a bit much but not bad. Way better than Georgetown Cupcake, but Baked & Wired will remain my favorite.